Reader Question: What is causing lesions under my dog's eyes? 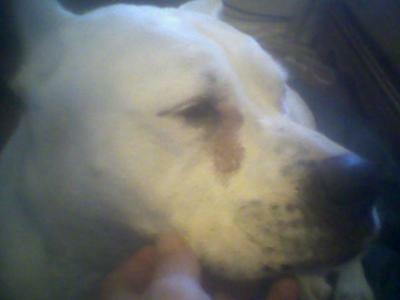 I have a solid white, deaf boxer/american bulldog. She developed brown spots on her skin as she matured. I called them sunspots. But, that is not the problem. She is now 9 yrs old and for the past couple of years she started developing that tear under the eyes discoloration. Gradually it started getting worse and she would be raw. Then she developed scabs that would bleed or just be raw flesh when rubbed. It is starting to spread above her left eye and spreading as far down as her mouth. She is starting the same problem under her right eye. I know I need to take her to the vet soon, but I just wanted some information about this problem first. P.S. She has always had sensitive skin too. And we had a large cyst taken off her leg this past spring. I can’t say with certainty what is going on with your dog based on your picture and description, but it sounds likely that the skin under her eyes is become damp and subsequently irritated and/or infected due to tear leakage. If this is the case, your veterinarian will need to determine if your dog is producing more tears than normal due to an eye problem or if the ducts that normally drain tears away from the eye are not functioning normally. If your dog were my patient, I’d start with a complete health history and physical exam and then likely move on to an eye exam using an ophthalmoscope followed by a test for tear production, an eye stain to look for wounds on the surface of the eye and to see if the stain drains into the nose as it normally would, and a check of eye pressure.